The Microsoft Deployment Toolkit (MDT) is a solutions accelerator from Microsoft to aid operating system deployment, MDT offers a subset of SCCM deployment features. 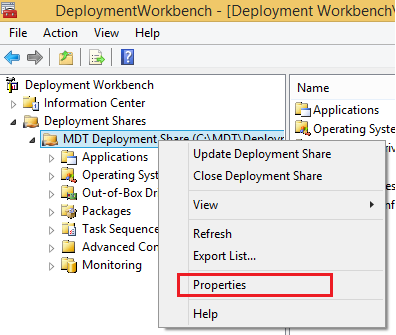 MDT uses Task Sequences to deploy and configure operating systems and applications. 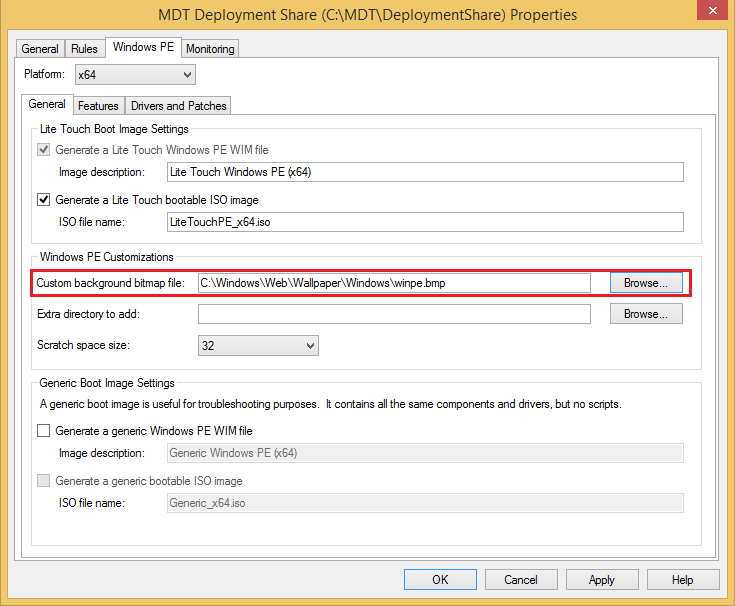 WinPE with Windows 8 and MDT 2013 is WinPE v5.0. 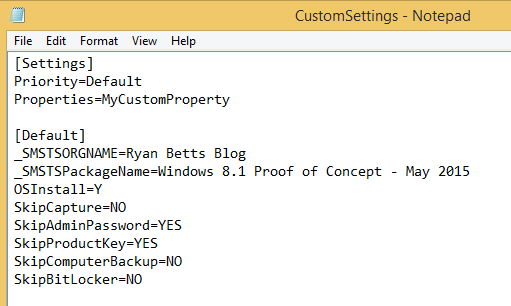 In this post I will document how you can customise the default WinPE environment. Customising the "IT Organization" field. To edit the "IT Organization" field, you must make a change to the CustomSettings.ini file that is installed as part of the Deployment Share. 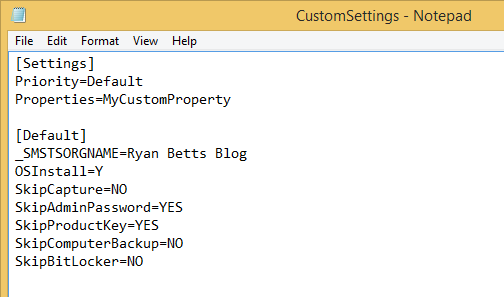 The CustomSetting.ini file can be found at C:\DeploymentShare\Control\, right click on the file and select "Edit". Add "_SMSTSORGNAME=organization name" below the [Default] container. 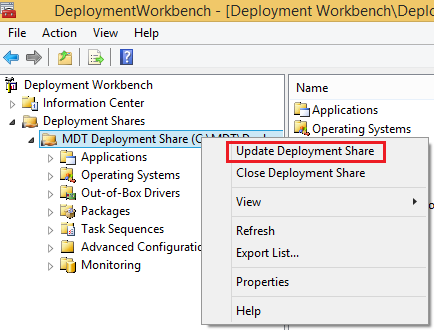 After making any changes to the MDT Deployment Share, you must always update the content. This can be done by right click on the Deployment Share and selecting "Update Deployment Share". You can also edit the "Running: " field on the Installation Progress box, I have found it good practice to change this to something descriptive, such as "Windows 8.1 Proof of Concept Project - May 2014". This must also be done from the CustomSetting.ini file, if you have follow above and already customized the "IT Organization" field your CustomSettings.ini file should look like my one below. 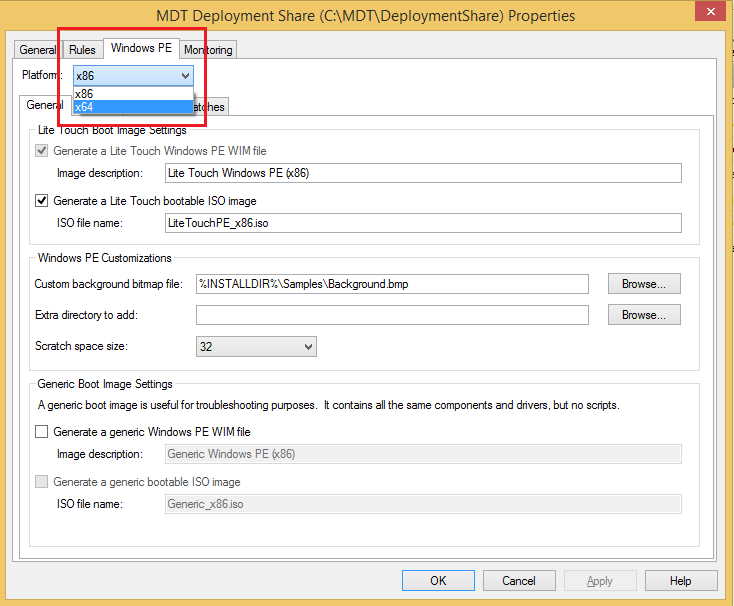 Again it is important to update the Deployment Share so that MDT registers the changes and re-reads the CustomSettings.ini file. It is also possible to change the WinPE background, I personally always like to change this to some kind of company branding, to do this you must have a suitable wallpaper in Bitmap format. You must first right click on the Deployment Share and select "Properties"
Click on the "Windows PE" tab from the "Properties" window, in this example I am only customizing the x64 WinPE environment therefore this may be slightly different for your environment, therefore select either x86 or x64 from the "Platform" drop down. I always copy my desktop wallpaper files to C:\Windows\Web\Wallpaper, therefore in this example I have pointed to my WinPE wallpaper Bitmap that is stored in the C:\Windows\Web\Wallpaper folder. 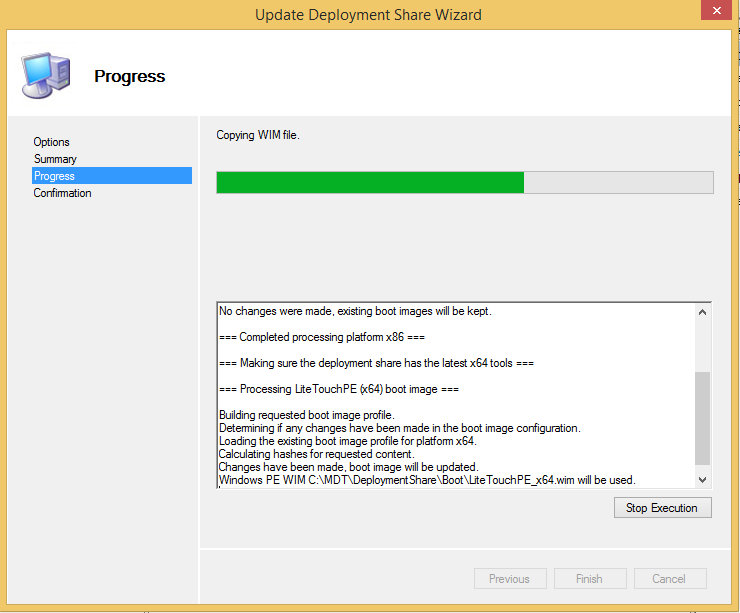 Updating the Deployment Share will take a few minutes after changing the Wallpaper, this is because MDT has to insert the Wallpaper file into the Litetouch_x86 and Litetouch_x64 ISO files.